Here in Toronto we love our spring and summer weather. But with the changing colours of the leaves we know that winter is right around the corner. You can see it on the streets; the winter coats are out of the closet and those leaves are tumbling along the sidewalks. In your neighborhood coffee shop you have probably heard talk of how ‘crisp’ it was this morning. If you are helping to care for a senior, there are some things you can do to help prepare for the cold weather. Before December arrives, use this checklist to make sure the senior in your life will be safe, comfortable and happy during the winter months ahead. Check the furnace – at this point in the season the furnace has already been put to good use. Check to ensure all the vents are open or that radiators are fully functioning. You may need to bleed the radiators of air. If there are floor-board electric heaters, ensure that there are no objects or fabric nearby that could potentially create a fire hazard. On that note – please ensure the smoke/CO2 alarm is functioning properly. Leaves, dirt and garbage should be cleared from the gutters and eaves. 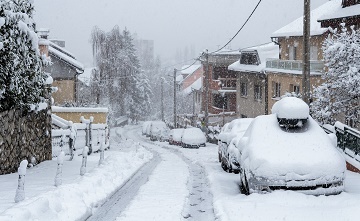 Snow and ice can accumulate on the debris, clogging gutters and increasing the chance for water damage in the basement. 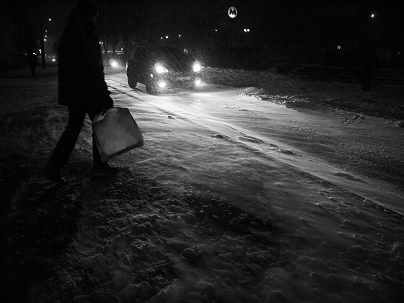 Think of the winter items that need to be accessible: boots, gloves, coats, salt, a cane or walker and a shovel. These items should be placed near the door or in the most accessible closet so that they are available when needed. Inspect the fireplace and chimney to ensure the flue opens and closes properly. Hire a chimney sweep if the chimney is full of dirt or debris. If you notice open mortar joints (spaces between bricks), have them filled immediately as this can become a fire hazard. Lastly, check to ensure the chimney is free of any animal nests. If the house does lose heat over the winter, pipes that might normally be safe are now susceptible to freezing. Any exposed pipes should be insulated with foam or heat tape. Check all doors and windows around the home to ensure they are not letting in drafts. Cracks and openings can be filled using weather stripping or caulking. It’s a Do-It-Yourself project that might be too difficult for the senior in your life. Lastly, make sure that all the outdoor gardening equipment and tools are completely drained of water and stored properly. This will help reduce the cost of replacing that garden house or sprinkler in the spring. Hopefully our checklist will help caregivers and seniors alike to prepare the home for the return of winter and all the slush, snow, sleet and frigid temperatures that comes with it. Next, we would like to mention a few points for Toronto seniors to remember to prepare themselves for cold weather. Cold air makes skin dry and can even make skin crack, this is especially true for seniors. Because a senior’s skin decreases in elasticity and becomes thinner over time, it is import to avoid painful cracks and tears that can lead to infection. It is time to start moisturizing on a regular basis, especially after a shower or bath and each time you wash your hands. Humidifiers are a very cost effective way of adding moisture to a dry room. Simple humidifiers cost from $25 to $50 but make a huge difference in the comfort of your home. They are quiet and easy to use, but make sure filling them on a regular basis will be an easy and safe activity. Two of our favourites are the Honeywell Quicksteam warm mist humidifier for large rooms, and the Crane cool mist humidifier for smaller rooms. Don’t be afraid (or too proud) to bring in some outside help to keep your driveway and pathways clear of snow and ice. Now is the time to buy a couple bags of road salt so that it’s there when you need it. Sprinkling some salt on outdoor steps and pathways can be the difference between getting out safely and taking a nasty fall. Ice is especially dangerous for seniors so if you are a planning an outdoor walk, be sure to bring your cane or walker to help keep your balance. You could also ask a family member, friend or caregiver to come with you. Invest in insulated, low-heeled boots that have the right traction for snow and house. A good quality coat, gloves and hat will help you enjoy the cold temperatures a little more and will also reduce your chances of frost bite or hypothermia. These ice and snow grippers for your boots may give you peace of mind. We have all heard of and probably experience the “winter blues.” Seniors are at an even higher risk of depression because they may feel more isolated during the winter months. No matter how cold it gets, make sure you stay busy and active. It might take a little more effort but if you ask for help you can keep up with your exercise and social life. On the topic of exercise, be sure to keep up your stretching and exercising routine. Being active and flexible will improve your circulation and keep you warmer. You will notice that your mood is better when you get your body moving. If you are working with a caregiver, he or she can help you with your exercises each day. There are few people who will describe winter as their favorite season. However, it can be made safer and more comfortable (and maybe more fun!) if we take the time to prepare. If you are interested in learning more about how our caring staff can support you or a loved one in Toronto this winter, please don’t hesitate to give us a call.